Hair: Bree by Catwa. New! Hair pin: By BOOF. Free! Shirt: Tied button down shirt by Alyce Store. Pants + Belt: Rica skinny jeans by Blueberry. New! Shoes: Adley wedges by Reign – 50L$ for FLF. Necklace: Verania by Pure Poison. Free! Dollar: Flexi 5$ bill. Free on MP. 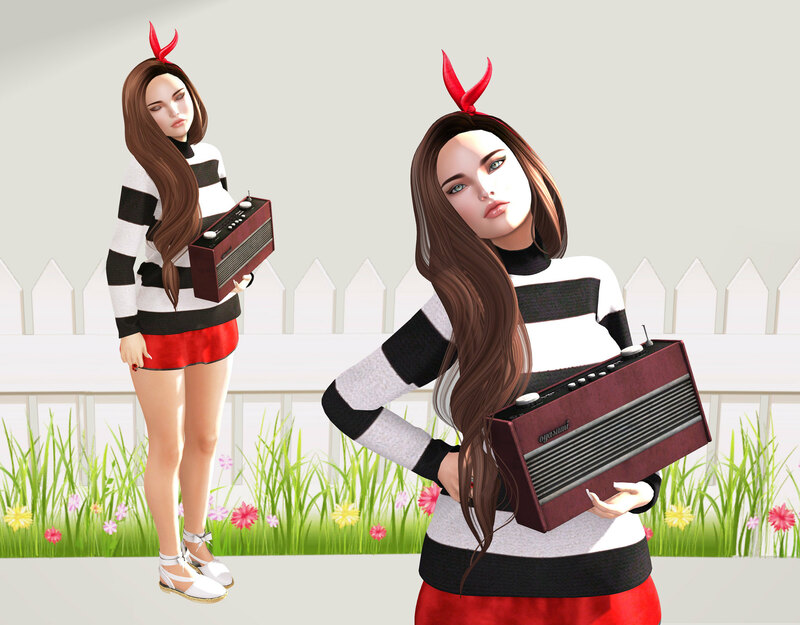 Hair: Tangerine by Moon Hair – Free for Hair Fair 2015! Headband: Comes with Kina Bento hair by Taketomi. Sweater: Striped sweater by Alyce Store. Skirt: Fitted skirt by Smart Or Not. Radio: Boxradio red by Oyasumi. Top: Ladies studded cardigan by Motivaction. Shorts: Dixie shorts by Alyce Store. Shoes: Dolly shoes by Mag – Only 2L$ on MP! Necklace: Subscribe gift by Amala.